CarGurus has 120 nationwide S8 listings starting at $9,990. The only change for the top-of-the-line Audi S8 quattro luxury sedan in 2009 is that what had been an optional Premium Package now comes standard. This package includes keyless start, a rearview camera, a power-closing trunk, power-closing doors, and a power rear sunshade. Other than that, the S8 retains the Lamborghini-styled 5.2-liter, FSI direct injected V10 that generates 450 hp at 7,000 RPM and 398 lb-ft of torque at 3,500 RPM. Coupled with a six-speed Tiptronic automatic transmission, this makes for a luxurious ride at a decent, mile-eating pace, and, being a quattro, during all sorts of weather conditions. Burning only premium fuel and with an EPA estimated 13/19 mpg, owners of the S8 are not inclined to complain about fuel economy. Though not overly quick, the 2009 Audi S8, essentially a performance-enhanced A8, will charge from 0-60 in 6 seconds and will top out at 155 mph (with a 60-0 stopping distance of some 112 ft). Finding someplace to travel that fast - legally - outside of the German Autobahn, however, may present a challenge, and that’s where this AWD four-door midsize sedan has found its niche - luxury trumps pure speed. Standard features for the ’09 Audi S8 include, besides the now-standard Premium Package, a four-link front, trapezoidal-link rear, sport-tuned, four-corner adaptable air-shock suspension, an impressive and aggressive chrome grille, power lift-and-slide sunroof, leather seating, Multi Media Interface, driver information display, 20-inch alloy wheels, a Bose surround sound stereo, a voice-controlled nav system, and a CD player - with phone. The ’09 S8 is a family car long on features and performance, but not nearly as pricey as the BMW Alpina B7 and Mercedes-Benz S63 AMG, with which it is most often compared. Believe it or not, atop this impressive list of standard features, the S8 offers a number of options packages. These include the Bang & Olufsen Advanced Premium Sound System with 14 speakers and a subwoofer, upgraded leather, four-zone climate control, the Technology Package with adaptive cruise control, and a Cold Weather Package including shift paddles on the leather-wrapped, heated steering wheel. Safety hasn’t been overlooked amid the S8’s opulence, either. In addition to ten airbags, the 2009 S8 offers four-wheel disc ABS, emergency braking assist, traction control, stability control, front and rear parking sensors, a remote anti-theft alarm system, electronic brakeforce distribution, and the standard rear-view camera. Some owners have described the Audi S8 as having “the best interior ever,” and all are impressed with the quality of workmanship and materials used in construction. Roominess, luxury, adequate to excellent acceleration and handling, as well as the large trunk (over 14½ cubic feet of luggage capacity) have also pleased owners. What's your take on the 2009 Audi S8? 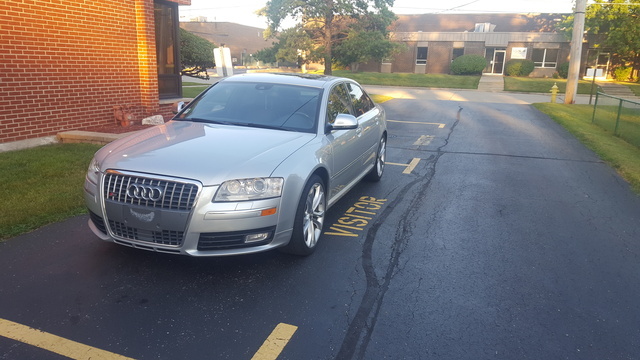 Have you driven a 2009 Audi S8?